Build Off World and Blender Benders wishes you a very warm and happy Christmas, we thank you for all being a part of us and we look forward to a great new year with lots more learning building and fun. A BIG thank you to all the sponsors and those who donate - we would not be here without your contributions. Our Sponsor Auryn Beorn owner of Black Tulip has sponsored an entire sim at this years expo! Proceeds from this years expo go to Relay For Life, an amazing organization that raises funds for Cancer Research and Relief. 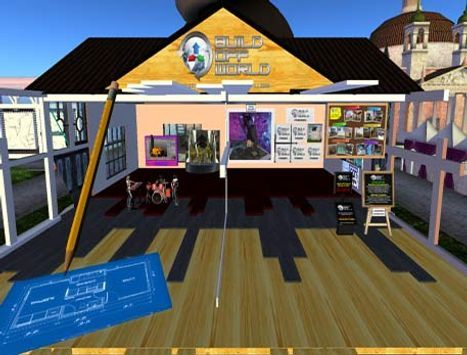 Auryn has been a long time supporter of RFL, and of Build Off World.. please support her by visiting her store at the expo. The Xmas Expo in support of Relay For Life! Dec 5th - 15th Featuring: Shopping, Entertainment, the Fashion Week Raffle for Relay, Avi Choice Awards, Naughty or Nice Gifts and SOO much more! Tuesday 17th December at 2pm SLT. Mesh Studio is a good stepping stone into making meshes and can be exported to Blender! Come to class to find out more on how it works. We are excited to announce the 'Builder of the Year' Competition, and you the builders will vote the winners. More information coming soon so stay tuned. GOOD NEWS! 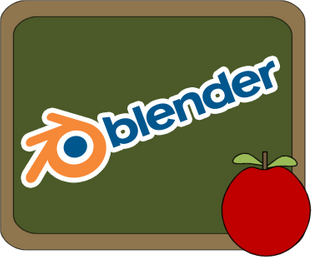 Blender Classes are being repeated! First 'repeat' lesson is Friday 19th July 2013, from then on they are held on Thursdays. You don't need any experience at all, just the latest Blender installed on your computer; then just turn up, watch and learn. Classes run for minimum 1 hour and plenty of feedback and help is at hand. You will soon be well on your way to using blender to make your own creations. Ask Graham for an invite to the BLENDER BENDER group for all the latest information and updates. Happy blending! BUILD OFF WORLD is proud to be an exhibitor at the SL10B. The SL10B Community Celebration is Second Life’s 10th anniversary resident-run gala celebration from June 16 to June 29. There will be 20 sims cram-packed with art, exhibitions, information, and events and we are very excited to be a part of it. 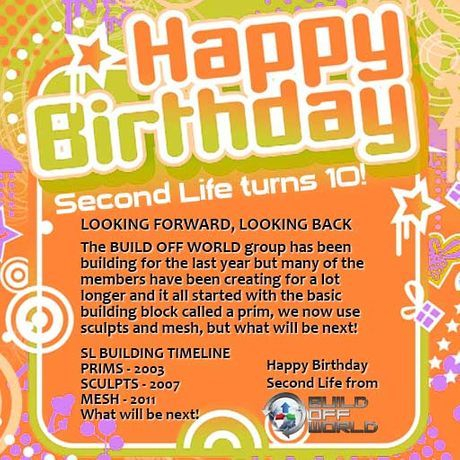 Thank you to all the talented builders for making Build Off World the fun place that it is to build today. 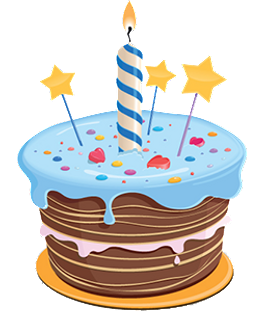 Coming up a birthday cake Build Off? haha TBA!! COMING SOON is the Cameraworks Video Class to be held on Saturday May 4, 2013 from 8:30 AM - 9:30 AM where we will learn how to use Cameraworks video to make movies in SL. A demo of the camera will be supplied to everyone at class. See you there. Blender Classes Coming to BOW soon! Blender is 3D creation for everyone, free to use for any purpose.